I was not at all surprised that the Common Raven was my first bird of 2015. They are very common in Anchorage. 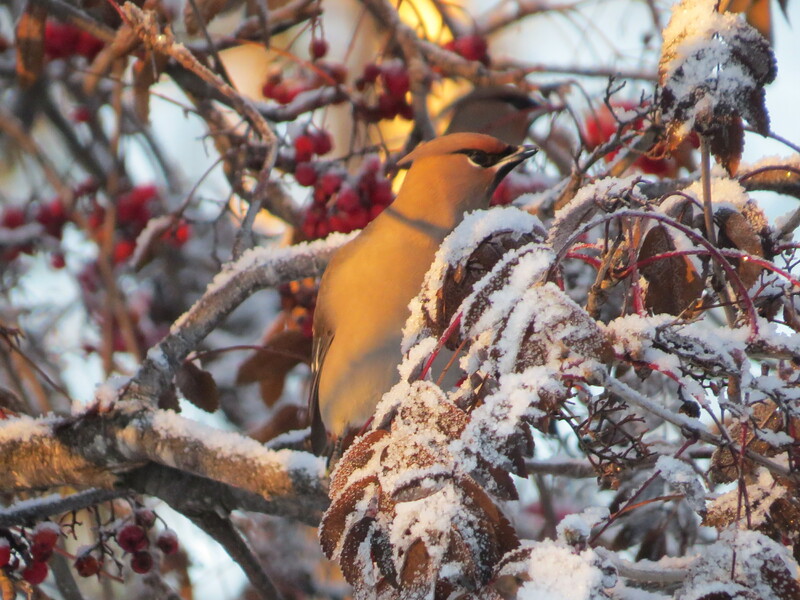 Shortly thereafter, in and over our yard, were Black-billed Magpies, Bohemian Waxwings, Black-capped Chickadees, Mallards, Red-breasted Nuthatches, Dark-eyed Juncos, and Common Redpolls. Then I heard a previously unheard sound for my Anchorage yard, an American Robin, flocks of which had been seen across town but not on our side of town. Day 1 of the year ended with a Downy Woodpecker, a small flock of White-winged Crossbills and a Steller’s Jay at a new feeder stocked with peanuts. I learned that like other jays the Steller’s Jays partially swallow a peanut whole, shell and all, with the swallowed peanut still visible in the bird’s open beak, and then grab another peanut and fly off, to stash one or both nuts somewhere and return to the feeder for more right away. 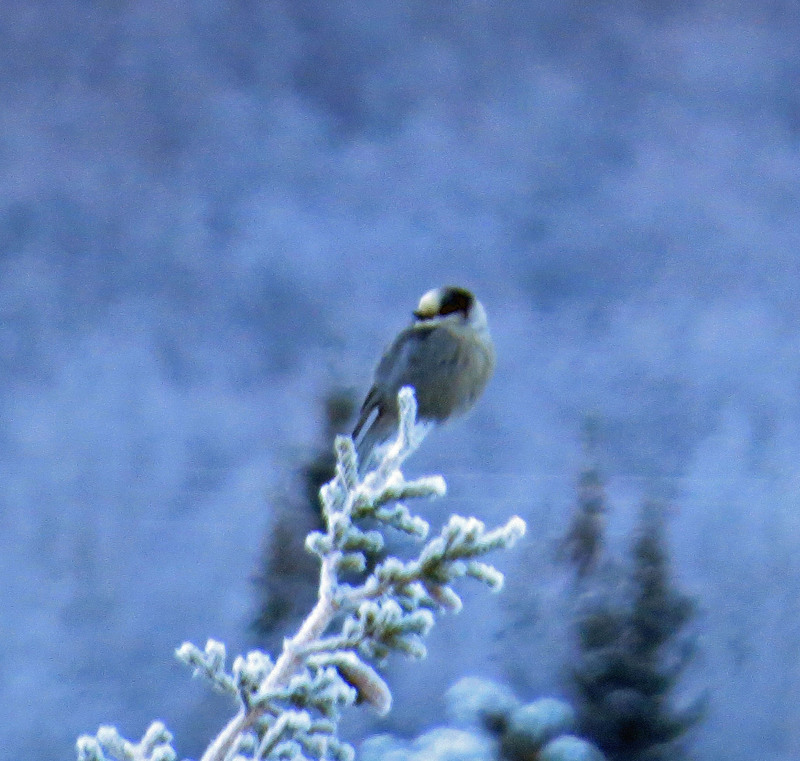 Following January 1, the birds in our yard were mostly repeats of day 1 birds, with added variety due to a flock of White-winged Crossbills that periodically invaded the nearby spruce trees and a small flock of Pine Grosbeaks, which began to eat from a couple of our bird feeders. 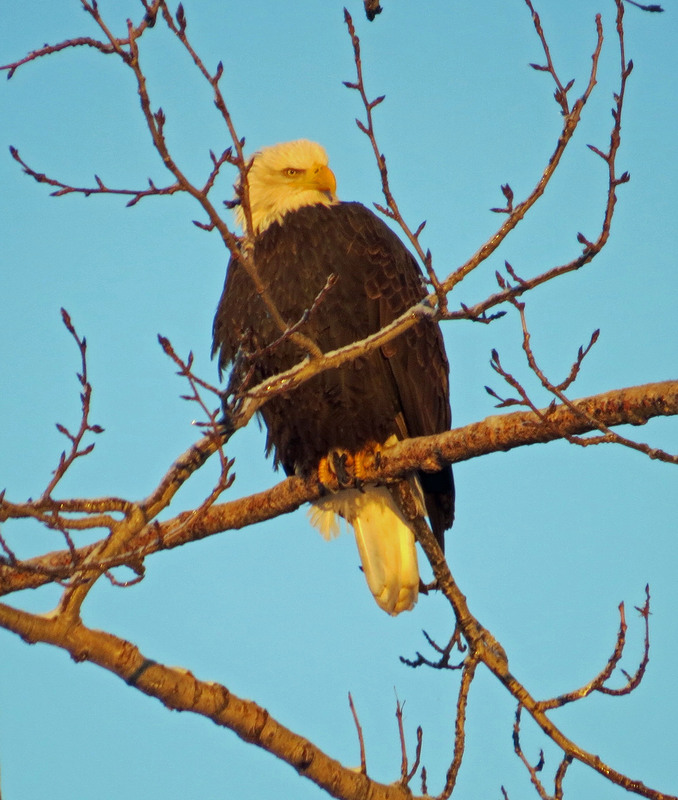 On Sunday, January 4th, I participated in my second Alaska Christmas Bird Count, the Eagle River CBC, about 12 miles north of Anchorage. The weather had been warm, but it turned cold (about 0 degrees F) that day and never got much above 5 degrees. Thankfully I was assigned a route in Eagle River itself, mostly in the car, with another Anchorage birder. Unlike lower-48 CBCs, our daylight birding could not start until about 9:30, and within 6 hours, the daylight was fading away. Not to worry, however, because there was plenty of time for us to find all the birds that were in our section, all eleven species. Again, given the widespread nature of most of the species that stay around here in winter, it was not surprising that there was a lot of overlap between the birds we saw on the Eagle River CBC and those I had seen in my yard the previous three days. In fact, only two of the CBC species that we saw were new for the year for me – the Bald Eagles (10 of them) and the Gray Jay (a single bird seen out over a foggy area, perched up so we could find it). The most numerous species in our area were Bohemian Waxwing (95), White-winged Crossbill (56), Black-capped Chickadee (29), Common Raven (28) and Black-billed Magpie (25). I expect the results for the whole CBC circle at Eagle River will be similar to ours, but I have not yet received them. Since participating in the CBC, I have explored a couple more local sites in the Anchorage area, upon which I will blog in the future as I learn more about these areas. The main excitement now though is backyard birding, especially the Steller’s Jays, which, like many jays, are VERY TAME. The day after I first offered them peanuts, I decided to see how close I could get to them with my hand stretched out toward them, holding an offering of unshelled peanuts. To my surprise, the very first time I tried this, one of the jays hopped on to my hand, grabbed a peanut and took off! 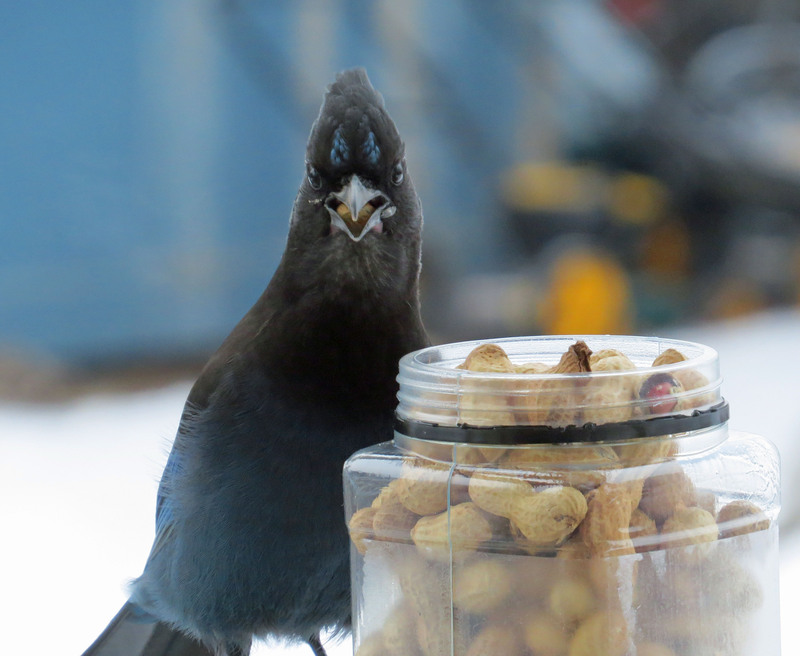 Now, every time I see jays near or on our back porch, I go out with peanuts and feed a few to the jays. They certainly are very friendly, probably due to past efforts of neighbors of ours somewhere. I’ve been told by other Alaska birders that I may regret making the jays my friends, and in fact one person had to work for three years to try to get her jays to NOT keep following her around everywhere. We’ll see. Post by Lynn Eileen Barber. I mentioned in an earlier blog post that I was not planning to do a big year this year, and this is still the case. I do find it hard to break my habit though, and whenever I hear about a bird that I have not yet seen this year, whether it be in Alaska or Texas or South Dakota or somewhere else in the ABA area, I have difficulty restraining myself from taking off to go look for the bird. It helps in my restraint that the roads have been icy and the weather has been cold and it’s usually dark outside and I’m a long way from everywhere….